Axon Global and the Global Manufacturing Information Sharing and Analysis Organization (ISAO), led by Israel Martinez, extended their international outreach from Global Fortune 500 companies in the U.S., the AsiaPAC and the Middle East, into the United Kingdom. At the request of the British Embassy, both joined efforts with an international delegation of UK and US cybersecurity innovators and thought leaders from industry and government at the Washington, D.C. British Embassy. The working group roundtables focused on bringing cyber stability internationally, included: Commercial; Law Enforcement; System Integrators; and the MSSP/ISP community. Others attending included the National Security Agency, DOD, DHS, and US CYBERCOM. Martinez stated at the conference that "cyber alliances and defining sovereignty in cyberspace are both key to a stable cyber society." 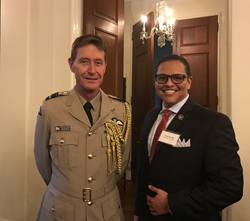 At the conclusion of the roundtables and at the invitation of Sir Kim Darroch, the British Ambassador to the United States, CEO Israel Martinez attended a private reception which included a warm welcome and thank you by AVM Gavin Parker, the Defense Attache of the Royal Air Force to the British Embassy and the U.S. Director of National Intelligence, the Hon. Dan Coates. Axon Global, with offices in Dallas, Washington, D.C. and NASA Kennedy Space Center, is also recognized by the National Association of Corporate Directors NACD, for Exemplary Board Leadership, where they advise F500 and Global 1000 board members in Cyber Enterprise Risk Management. Since 2003 Clients cross all major industries including F500 global companies, Mid-Market Companies, private equity, academia, U.S. government allies, the U.S. Department of Defense, and the Defense Information Systems Agency. Axon also serves as Sr. Advisor to, the Global Manufacturing ISAO; the American University Kogod Cyber Governance Center; the Global Institute of Cyber Security Research, partnered with NASA and NATO; and the HMG Strategy Group.